With incremental linear encoders, the current position is determined by starting at a datum and counting measuring steps, or by subdividing and counting signal periods. Incremental encoders from HEIDENHAIN feature reference marks, which must be scanned after switch-on to reestablish the datum. This process is especially simple and fast with distance-coded reference marks. Length gauges from HEIDENHAIN offer high accuracy over long measuring ranges. These sturdily made gauges are available in application-oriented versions. HEIDENHAIN length gauges are built for an industrial environment. They feature consistently high accuracy over a long period of time as well as high thermal stability. They can therefore be used in production equipment and machines. .
Absolut angle encoders and rotary encoders require no previous traverse to provide the current position value. Singleturn encoders provide the current angular position value within one revolution, while multiturn encoders can distinguish between revolutions. Absolute angle encoders and rotary encoders from HEIDENHAIN provide the position values over an EnDat, SSI, PROFIBUS-DP or other serial data interface. The EnDat PROFIBUS-DP bidirectional interfaces enable automatic configuration of the higher-level electronics and provide moitoring and diagnostic functions. With programmable rotary encoders, the user can adjust various encoder functions and parameters from a PC with provided software. C axes on lathes are typically used for the machining of bar-stock material. Here the graduation of the ERM modular encoder is usually on a diameter that is twice as large as the workpiece to be machined. The accuracy and reproducibility of the ERM also achieve suffi cient workpiece accuracies for milling operations with lathes (classical C-axis machining). 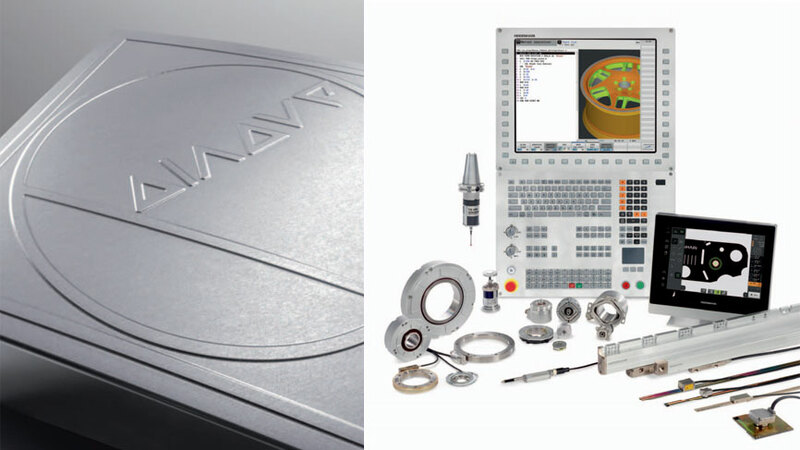 For almost 30 years, TNC controls have been proving themselves in daily use on milling machines, drilling and boring machines, and machining centers. This success is due in part to their shop-oriented programmability, but also to their compatibility with programs of the predecessor models. TNC contouring controls from HEIDENHAIN for milling, drilling, boring machines and machining centers cover the whole range of applications: From the simple, compact TNC 320 three-axis control to the iTNC 530 (up to 13-axis spindle) - there's a HEIDENHAIN TNC control for nearly every application. High surface definition, high contouring accuracy of the finished workpiece, and short machining times - these requirements can be met only with digital drive concepts. For integrated drive control, HEIDENHAIN offers the iTNC 530. Either compact or modular inverters are available, depending on the type of machine. The compact inverters contain the power stage for up to 3 axes or 4 axes plus spindle with spindle power ratings up to 15 kW. Feed motors of 1.5 Nm to 44 Nm and spindle motors of 5.5 kW to 30 kW are available for connection to HEIDENHAIN inverters. Machine tool performance from the point of view of compliances to tolerances, surface defi nition, etc., is determined essentially by the accuracy of machine movement. 3-D touch probes from HEIDENHAIN were conceived for use on machine tools – in particular milling machines and machining centers. 3-D touch probes help to save costs: NC controls can automatically run setup, measuring and verification tasks – and most controls can also run them under program control. The stylus of a TS three-dimensional touch trigger probe is deflected upon contact with a workpiece surface. This releases a trigger signal in the TS that is transmitted to the control either through a cable (TS 220 and TS 230) or as an infrared light signal (TS 7xx, TS 6xx, TS 4xx). The control simultaneously saves the actual position values as measured by the machine axis encoders, and uses this information for further processing. With the TT 140 three-dimensional triggering touch probe, the contact plate is deflected from its rest position, sending a trigger signal to the NC control, during probing of the stationary or rotating tool. The TL laser systems operate without any contact. A laser beam probes the length, diameter or contour of the tool. Special measuring cycles in the NC control evaluate the information. Machine tool performance from the point of view of compliances to tolerances, surface definition, etc., is determined essentially by the dynamic and static accuracy of machine movement. For precision machining it is therefore important to measure and compensate motional deviations. Guidelines and standards for inspecting machine tools (ISO 230-2, ISO 230-3 and ISO 230-4, and VDI/DGQ Directive 3441) stipulate a number of measuring methods for determining dynamic and static deviations. Conventional inspection and acceptance testing of machine tools has been limited essentially to static measurement of the geometrical machine structure without load and on controlled machines to measuring positioning accuracy. Since the results of machining depend increasingly on dynamic deviations from the nominal contour and on high accelaration in the machine tool, the finished parts are also inspected for dimensional accuracy in order to draw conclusions about the dynamic behavior of the machine. The HEIDENHAIN measuring systems KGM and VM 182 can now be used to directly measure both dynamic and static components of deviation. The advantage of this direct inspection method over inspecting only the results of the machining lies in its separation of technological influences from machine influences, and in its capability of distinguishing individual factors of influence. Dynamic measurements - especially at high traversing speeds -provides information on contouring behavior that permit conclusions about both the condition of the machine tool as well as the parameter settings of the control loop consisting of the CNC control, drives, and position feedback systems. Static measurements - such as the measurement of position deviations in the linear axes using a comparator system - permit conclusions exclusively about the geometric accuracy of the machine. Machine tool builders use the results of machine accuracy inspection for the purpose of making design improvements to increase accuracy. Such measurements also help them to optimize the commissioning parameters of the control loop wherever they influence the accuracy of a CNC machine. Interface electronics from HEIDENHAIN adapt the encoder signals to the interface of the subsequent electronics. In addition to being converted, the sinusoidal encoder signals are also interpolated in the interface electronics. This results in finer measuring steps, leading to an increased positioning accuracy and higher control quality.